Despite being one of the best performing countries in the world in terms of gender equality due to the presence of various measures promoting it, violence against women and girls (VAWG) still exists in the Philippines until today. It exists in every space of the society beginning from the community level up to the government level and even in the cyberspace. Child marriage is one example of this problem that compromises the security and development of women and girls. A great deal of studies has shown that this phenomenon gravely affects all aspects of a girl’s life including her childhood, education, and employment opportunities, forfeiting her chances at a bright future. It also exposes her to several health risks such as pregnancy- and childbirth-related complications. Indeed, pregnancy- and childbirth-related complications are the leading causes of death for young women aged 15-19 around the world. Moreover, child marriage also increases her risk of violence and abuse from their husband and in-laws as these girls are often married to older men and live in the house of their husbands. Child marriage, just like any other forms of VAWG, is a form of grave human rights violation that needs to be stopped. The Philippine Legislators’ Committee on Population and Development (PLCPD) sees the upcoming 2019 midterm elections as an arena for change. It views the elections as an avenue to magnify, and consequently, to eliminate all forms of violence against women and children that have been prevalent in the country for years now, impeding the right to genuine growth and development of this sector. PLCPD also recognizes the crucial role of policymaking in ensuring that the rights of women are recognized, upheld, and well-respected. 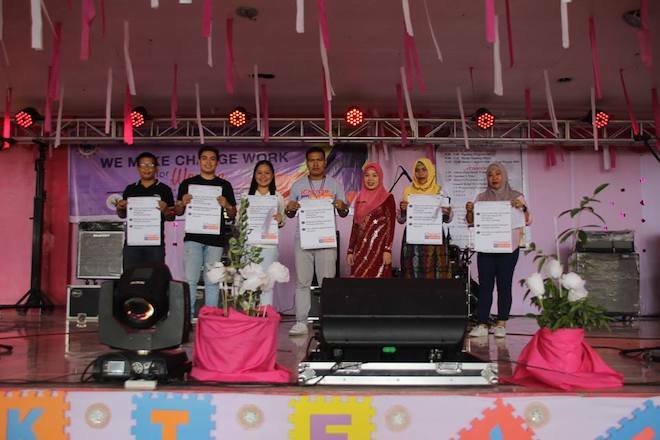 It is in this context that PLCPD, through the project Creating Spaces to Take Action on Violence against Women and Girls, launched the “iChange: vote against VAWG” campaign which aims to raise public awareness on the issue of VAWG in the country and to identify and develop potential policy champions among candidates. In this campaign, PLCPD specifically calls for the enactment of a law that will prohibit and criminalize the facilitation of child marriage in the country. Furthermore, PLCPD calls the attention of the candidates to adopt measures that will protect the rights of the women and girls, when elected. iChange: Vote against VAWG embarked on a voters’ education series and concert tour. The first part is a voters’ education forum where stakeholders from different sectors discussed the impacts of VAWG and why it is important to end it. They also called on the candidates of the upcoming 2019 midterm elections to be champions of the rights of women and girls and to be one with the fight against all forms of VAWG. In return, some national candidates were present to share their platforms and to give their pledge of commitment in ending VAWG. 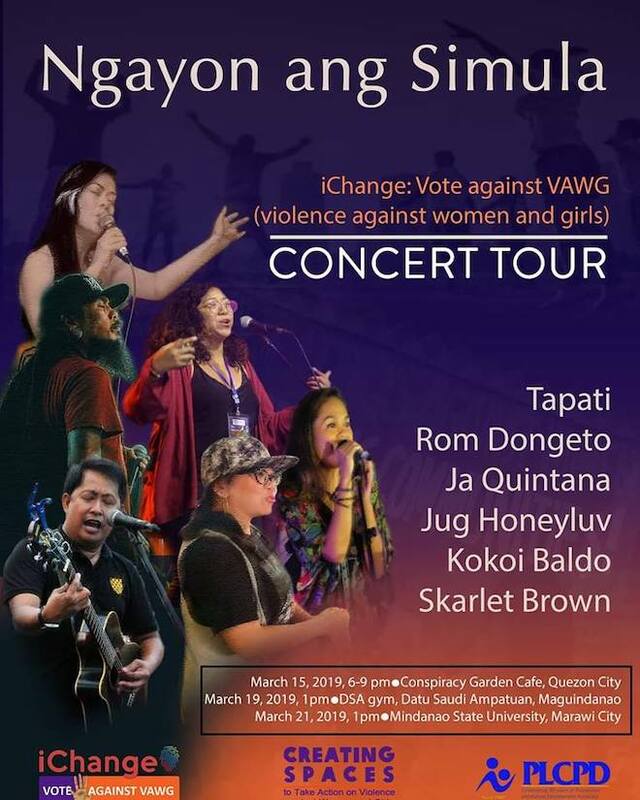 The second part showcases various progressive artists such as Tapati, Ja Quintana, Rom Dongeto, Kokoi Baldo, Jug Honeyluv, and Skarlet Brown who have shared their talents in a concert that aims to utilize the power of music as an effective platform in raising different societal issues. PLCPD also produced a music video for the campaign’s official theme song entitled “Ngayon ang Simula” written and composed by PLCPD’s executive director, Mr. Rom Dongeto..
After its launch in Quezon city, this campaign was brought to the provinces of Maguindanao, and Lanao del sur. 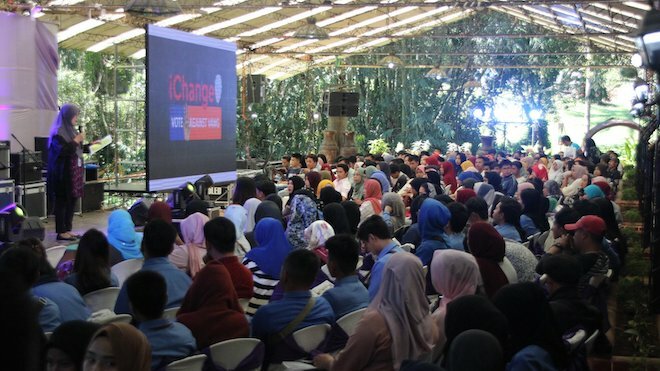 This activity is part of a larger campaign entitled “iChange: vote for our future”, an issue-based campaign aimed to mainstream several human development issues and to influence the platforms of the candidates as well as the voting criteria of the voters. Empower women, ensure their participation in peacebuilding and development. This was the call of the constituents, advocates, stakeholders, and participants from five provinces of ARMM that gathered together in the recently-concluded regional dialogue organized by the Philippine Legislators’ Committee on Population and Development (PLCPD). The dialogue came after the historic ratification of the Bangsamoro Organic Law, creating the new Bangsamoro region. It is in this context that this dialogue discusses the crucial link between women empowerment and the realization of lasting peace in the region. It is comprised of three plenary sessions and one talk show that explored the interrelatedness on women’s health and rights, peace, and development. Among the highlights of the dialogue is the discussion on the importance of fulfilling women’s rights in peacebuilding as well as in other issues confronting the region. Resource speakers coming from different groups and government agencies emphasized the need to adopt a gender-sensitive lens whenever tackling peace and security issues and the need to engage women in conflict situations as they are the ones who suffer the most in times of conflict. “Women are burdened with caring for the rest of the family members, further making their reproductive role more burdensome,” said Ms. Noraida Abo of UNYPhil-Women. In line with this, partners from the BARMM shared their experiences and best practices in providing sexual and reproductive health (SRH) services in the region especially in times of conflict. Some of these good practices include raising public awareness on issues such as family planning, SRH, and gender-based violence, distributing IEC materials, ensuring public participation, training and capacitating students and Muslim religious leaders as well as local health service providers, providing RH-related services, and establishing hotline numbers. Moreover, in the context of the new Bangsamoro government, the panelists also touched upon the significance of this new government set-up in providing SRH-related services in the region and the opportunities that advocates can take advantage of in mainstreaming women’s rights and in ensuring that these rights are being upheld and respected. “There is a provision in the BOL saying that there should be women’s representation in the decision-making and policy-determining bodies in the Bangsamoro government… and that there should be mechanisms for consultation with women and other marginalized groups,” said Hon. Raissa Jajurie of the Bangsamoro Transition Authority. The panelists of the talk show, which included Rep. Teddy Baguilat, Atty. Ishak Mastura, and Ms. Akrima Arap, also reminded everyone the significance of this new government which could possibly be replicated by other regions as well as the challenges that may confront it as the transition moves forward. While being skeptical about the prospects of a federal set-up for the country, Rep. Baguilat mentioned that the developments that will happen in the region could provide support for or against President Duterte’s federalism proposal. A plenary session was also held to discuss key issues concerning adolescent reproductive health and why investing in young people’s health is crucial in achieving development. Ms. Janette Dimakuta of DOH-BARMM presented some data on the situation of adolescents in the country and two youth leaders from Maguindanao and Lanao del Sur were present to provide their personal experiences on the issues confronting their peers and to forward their call against some practices like child labor and child marriage (CEFM) that hinder their genuine growth and development. “We, the children, are too young to get married,” said Ms. Fatima Sugadol, a youth leader from Maguindanao. Participants of the dialogue also identified key concerns in SRH and VAWG in their respective provinces and the actions that they can do to address them in a workshop session aimed to discuss possible scenarios after the ratification of BOL and to propose an action plan on mainstreaming women and girls’ rights in BARMM. The regional dialogue concluded with a symbolic action in solidarity with the celebration of International Women’s Day. This project is made possible by the support of the European Union, Oxfam Canada, Oxfam sa Pilipinas, and Global Affairs Canada. Since 2017, the Philippine Legislators’ Committee on Population and Development (PLCPD) and its partners in the Autonomous Region in Muslim Mindanao (ARMM) have organized three national and regional dialogues that provide a platform for duty-bearers and stakeholders to discuss issues and propose collective recommendations to contribute to the fulfilment of Filipinos’ sexual and reproductive health and rights (SRHR). 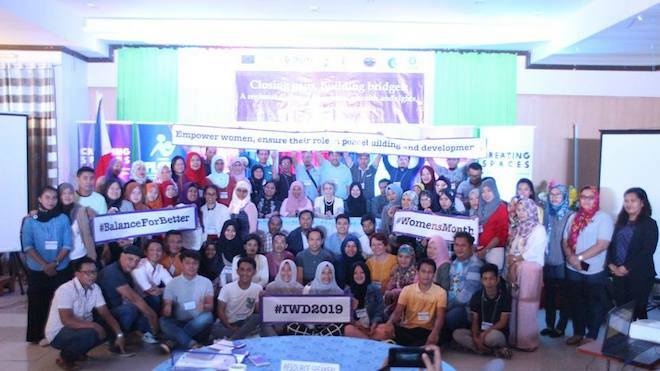 Now in its fourth installment, this dialogue brings together participants from five different provinces in the Bangsamoro region to explore the interrelatedness of fulfilling women’s health and rights, women empowerment and closing gender gaps, and the achievement of peace, security, and development. The Reproductive Health Law is a landmark legislation that aims to protect the health and lives of mothers and their children through the provision of services and information on reproductive health, among others. However, hampered by challenges like legal barriers, lack of adequate funding and willingness of some LGUs to implement the law, and lack of public knowledge and awareness, the full implementation of the law has not yet been realized, more than six years after its enactment. On the other hand, despite being one of the best performing countries in terms of gender equality due to the presence of various measures promoting it, violence against women and girls (VAWG) is still rampant and widely normalized in the Philippines until today. Child marriage, for instance, is one example of this problem present in the country that compromises the safety and development of its women and girls. Given these formidable challenges, PLCPD optimistically views the recent ratification of the Bangsamoro Organic Law as a milestone event and an opportunity to advance its advocacies specifically on gender equality and women’s health and rights in the newly-formed transitional government. It is an opportune moment for the advocates to accelerate the implementation of existing policies and to explore possible programs and policies that would potentially address the issues concerning SRHR and gender inequality. In line with that, PLCPD calls for the transitional government to uphold rights of the women and to provide equal opportunity for them as the persistence of gender gaps may detrimentally affect the efforts to achieve peace, security and development. The dialogue also coincides with the celebration of International Women’s Day. PLCPD, through this dialogue, hopes to explore the crucial link between women empowerment and the achievement of lasting peace in the region. Many studies have shown that participation of women in conflict resolution increases the probability of a lasting peace agreement. International instruments have also recognized and reaffirmed the important role of women in these peace processes. This dialogue aims to produce a call to action for complementing national-level advocacy and for advancing relevant legislation at the regional level and an action plan for mainstreaming women and girls’ rights and reproductive health in the BARMM which advocates can use as guides in collectively pushing for the advancement of their goals. It is hoped that stakeholders will be given a platform to present the agenda to the BARMM and that the output can effectively be transmitted to the region’s newly-appointed leaders and be converted to concrete policies and programs. Working together, advocates and leaders can come up with measures to achieve full realization of SRHR of all and to eliminate of all forms of violence against women and girls, and consequently, to achieve lasting peace and development in the region. 28 February 2019—Nine out of 10 adult Filipinos agree that smoking or the use of cigarettes in public places should be prohibited. This is according to the results of a national survey on smoking conducted by Pulse Asia from January 26 to 31. Presented during the launch of “iChange: Vote for a smoke-free Philippines,” an electoral campaign led by the Philippine Legislators’ Committee on Population and Development (PLCPD), the results of the nationwide survey also reveal that nine out of 10 Filipinos agree that the minimum age of those allowed to buy and use cigarettes should be raised from 18 to 25 years old. “The results of this survey show that the Filipino public is very open and receptive to essential legislative reforms that can be done as regards tobacco control. May this piece of information have a deep impact on candidates for the 2019 midterm polls, for them to resolutely pursue measures that will contribute to a smoke-free Philippines,” said PLCPD Executive Director Romeo Dongeto. The Pulse Asia survey also reveals that while almost 8 out of 10 Filipinos (76%) aged 18 years and above say they do not use tobacco, with 62% saying that they never used tobacco in their life, almost one in four Filipinos aged 18 years and above (24%) use tobacco, with 19% saying they are daily tobacco smokers. “These figures show how deep the smoking problem is rooted in Philippine society. Despite recent strides our nation has taken to control tobacco use, we still have a long way to go. That is why we are launching the iChange campaign, a drive we are pursuing in time for the election season, with the specific goal of making this issue be at the forefront of electoral debates and garner support from incoming elected officials towards crafting and enacting stricter laws on tobacco control,” Dongeto explained. Present during the launch of the iChange campaign were Dr. Charl Andrew Bautista of the Department of Health, who discussed the burden of tobacco use on Filipino health, and several other advocates from HealthJustice, Southeast Asia Tobacco Control Alliance, Social Watch Philippines, and Youth for Sin Tax. The groups highlighted the policy reforms needed by the country and why it is important to talk about tobacco control during the election period. “The election period is what we call the noon for public clamor, as we all know that candidates running for public office are most receptive to public opinion during this period. That’s why advocates need to sound the alarms on tobacco use even louder at this moment in time. We also hope that voters will consider important issues such as health in making the important decision of choosing whom to vote,” Dongeto stressed. The iChange campaign called on 2019 election candidates to support moves to amend the current Tobacco Regulation Act (Republic Act 9211), to expand the definition of places where smoking is banned, raise the minimum age for buying and using cigarettes from 18 to 25 years old, and increase the tax imposed on tobacco products by at least P60 to make cigarette prices prohibitive and to generate revenue to support the government’s universal healthcare program. “Evidence of overwhelming public support for these amendments is here. Nine out of 10 Filipinos agree to stricter tobacco control laws. May this pressing public health issue deeply penetrate into the national conversation and compel our next legislators and government officials to act,” Dongeto concluded. After the launch on February 28, the iChange: Vote for a smoke-free Philippines campaign will hold a series of media events and voters’ education forums in Laguna, Albay, Cebu City, and Iloilo City. The Philippine Legislators’ Committee on Population and Development Foundation, Inc. (PLCPD) is looking for an individual who is interested to work full time as advocacy and partnerships officer. The advocacy and partnerships officer will be assigned to handle advocacy for multiple issues related to human development, particularly on promoting a smoke-free environment and health, rural development, children’s rights, and gender equality. Experience in and passion for advocacy work is required. Interested applicants may send their CV and letter of application addressed to Mr. Romeo Dongeto, executive director, to plcpdfound@plcpd.org.ph (cc: nenitadalde@plcpd.org.ph). Generates activity and project reports. The Philippine Legislators’ Committee on Population and Development Foundation, Inc. (PLCPD), a non-government advocacy organization composed of national legislators, is looking for a highly committed individual to fill the position of Media and Communications Officer. management/implementation of short-term and strategic communication projects and activities of the institution. Here is the detailed job description and competency requirements for the position. Shortlisted applicants will be notified by 26 February 2019. On January 23, the House of Representatives overwhelmingly and hastily approved a bill that lowers that minimum age of criminal responsibility (MACR) from 15 to 12 years old, amending the current Republic Act 9344 or the Juvenile Justice and Welfare Act of 2006 (JJWA). Senate is expected to also approve of its version soon. The bill is yet another attempt of Congress, under the leadership of Gloria Arroyo and Tito Sotto, and the Duterte Administration to revert all the positive gains under the JJWA and to trample on the rights of the children, the very sector it vows to protect. International and local groups and organizations advocating for the rights of the children have already expressed their disappointment and fierce opposition to the proposed law, calling it an act of violence against children. Advocates have also expressed their concern on the severe conditions of youth care facilities around the country and their doubt that these could adequately and effectively cater to the needs of the children in conflict with the law (CICL). The Child Rights Network (CRN) firmly believes that lowering the MACR goes against the best interest of Filipino children. It is not the solution to both the problems of children being involved in and children being used for criminal activities. This proposed measure is anti-poor, anti-human rights, and anti-children. Apart from being plainly absurd, this measure is also unfounded, misguided, and uncalled for. Data from the Philippine National Police show that only 1.72% of reported crimes are committed by children. Furthermore, subjecting these children to the country’s flawed justice system and to the arduous judicial process is utterly inhumane and would traumatize them for the rest of their lives. These children are already victims of the harsh environment and society that they live in. Approving this proposed law will just further victimize them as they would be dehumanized and stigmatized, impeding their rights to survival and development opportunities. A great deal of studies have shown that criminalizing children leads to recidivism. Detention and/or incarceration of children have also been linked to adverse effects on a child’s mental, physical and emotional development, as they are likely to be subjected to discrimination and abuse while detained. Furthermore, jailing children deny them of opportunities for advancement through education, and future employment. The proposals to lower the minimum age of criminal responsibility also ignore scientific evidence that a child’s brain is still structurally and functionally immature and that the brain reaches full maturity at the age of 25. The Child Rights Network, together with other child’s rights advocacy groups, vehemently opposes the bill and reiterates its call to retain the current MACR. Rather than lowering it, the government should instead focus on strengthening the implementation of the JJWA and on improving the facilities for children in conflict with the law. CRN further believes that rehabilitation is still the more effective and sound solution to the increasing number of child offenders. Evidence shows that these measures are effective in restoring and reintegrating children to the community, as documented by child rights advocates. CRN also calls on all legislators to address the root causes of the problem instead of targeting the children. Finally, CRN enjoins everyone to remain vigilant with all the development in the proposed law and to strongly resist all attacks against the rights of the children. Children are not criminals. The real criminals are those who use and exploit the children to engage in criminal activities. The real criminals are those in the government who blatantly disregard and step on the rights of children in exchange of political gains. These are the real criminals that should be punished and be put in jail.